The PA6500 series are the top tier of non-3D plasmas from LG for 2012. It has a 1080p plasma panel and a new black filter but custs cost by eliminating features such as 3D and online connectivity. The 50PA6500 has a new black filter that increases both black levels and contrast for a greatly improved picture over previous models. Along with the improved black levels and contrast comes improved color and improved detail in dark scenes and shadows. 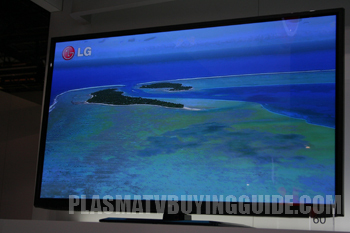 LG has stepped it up with their 2012 plasmas showing a marked improvement over previous models. This is an area where plasma still dominate LCD and LED screens. On the 50PA6500 the picture remains vivid from the center of the screen until you move far enough left or right that you can no longer make out what is on the screen. This is an area people discount at first but with these large televisions there are often guests watching movies or sports and if they are not directly in front of the screen their experience may suffer. With it's slightly rounded edges and slim black bezel the 50PA6500 is definitely an attractive television. The matte screen is not what we are used to seeing on a plasma but this is a very good looking television.